Amanda lives in Liverpool with her daughter Jessica and writing was most definitely a late discovery for her. She didn’t really begin to explore creative writing until she was almost 40, at which point her young son Nathan was fighting for his life. Poetry and keeping a journal helped me through those difficult times and the darker times to come when he died in 2006. He was three years old. She continued to write and in 2010, she found an agent. Shortly afterwards in 2011 she was offered a book deal with HarperCollins. Her first novel ‘Yesterday’s Sun’ was published in January 2012 and she was absolutely thrilled when it was selected for the Richard and Judy Spring Book Club List. I wasn’t one of those people who grew up always knowing I’d be a writer. I was in my late thirties before I took any real interest in writing, and it was at a time when I was dealing with a nightmare rather than pursuing a dream. My son, Nathan was twenty one months old when he was diagnosed with leukaemia in 2004 and I found writing poetry and keeping a journal helped me remain strong for both my son and his older sister Jess. When Nathan died in 2006, writing was a way for me to process my grief. At first I wrote about my son but once all of those precious memories were committed to paper, I found I wanted to carry on writing. Yesterday’s Sun was my first attempt at women’s fiction and was inspired by my experiences of motherhood. The story not only secured my first book deal but was selected for the Richard and Judy Book Club in 2012. I’m slightly stunned to be publishing what will be my ninth novel, and all because of one little boy who left behind an amazing legacy. Can you tell us a bit about your upcoming book, ‘Don’t Turn Around’. The story opens ten years on from Megan McCoy’s death and is told from the perspectives of Meg’s mum, Ruth and her cousin, Jen who was also her best friend. Meg died from suicide and in the years since her death, her parents have established a charity in her name and currently operate a helpline for young people in crisis who need someone to talk to. The family are trying to rebuild their lives but there are questions that haunt them. What hold did her boyfriend have over her and why did she protect him to the very end? Was the brief note she left meant to be a cryptic message or did someone destroy part of the note before her father found her body? The family had thought they had come to accept there are no answers, but then a young woman phones the helpline and reveals things that only Meg could know. Is she suffering as Meg had suffered and can they save her? Actually, I’ve recently been invited to join a book club in Liverpool and that group includes Sarah Haywood who wrote ‘The Cactus’. It was one of my favourite reads of 2018 so Sarah would definitely be on my wish list. There are a few other local authors I also like to keep in touch with so I’d happily chat books with Caroline Smailes, Catherine Isaac, Debbie Johnson, Rachel Lucas, Mary Torjussen and debut author Caz Finlay whose first book, ‘The Boss’ is out later this year. If there’s room for more, I’d love to invite Cecelia Ahern as I was a big fan of her books long before I’d ever thought of writing one myself, and we now share the same publisher. That’s a tough one to answer because I doubt I would have become a published author if my son hadn’t died, so there’s always going to be a part of me that wishes I had never had to start my writing journey. Thinking beyond that, I don’t think I would change a thing. I consider myself extremely fortunate to have become a published author. I gave up my day job two years ago and it’s thanks to my publisher and my readers that I’m now doing something I love and long may it continue. Who’s your favourite literary villain? I’m going to be cheeky here and name one of my own characters. In ‘The Bad Mother’, Adam is responsible for mentally abusing his wife, using a form of abuse known as Gaslighting. He was outwardly charming but he was ruthless and cruel as he stripped his wife of her confidence and her sanity. When the book was published, it was the first time I’d ever had hate mail, although I should point out it was directed at Adam rather than me. I was thrilled that readers hated him as much as I did. I’m going to pick something I’ve read recently and that was ‘Our House’ by Louise Candlish. The opening line is: ‘She must be mistaken, but it looks exactly as if someone is moving into her house.’ It sums up the premise of the story perfectly because it’s about a woman who comes home one day and discovers someone has sold her house without her knowledge and a new family are moving in. The hook is there immediately and it’s another of my favourite reads of 2018. I was a big fan of horror in my teens, having started my obsession with ‘Carrie’ by Steven King but the stand out novel for me was ‘Watchers’ by Dean Koontz. It’s about two creatures who escape a secret government experiment. One of them isn’t so nice but the other is an extremely clever dog called Einstein and now I’ve thought about him, I need to go back and read the book again. I’m not sure I’d describe my books as crime novels although my last few have become darker and there are certainly crimes involved. However, I’m more interested in the telling the victims’ stories and exploring what impact the crime has on them and their families. I do tend to put my characters through emotionally wrought experiences but they come out fighting and they’re the ones who ensure justice is done, not the police. I mentioned reading horror in my teens but I also loved fantasy and one of my favourites is ‘Lord of the Rings’ and because it’s a trilogy, I’m sneaking three books in for the price of one. My second selection would be one of Jane Austen’s novels. After reading ‘Pride and Prejudice’ at school, I went on to read her other books and loved them all. I’d happily add any of them to my book pile but at a push, I’d choose ‘Persuasion’. My last book would be a collection of poetry. I don’t know if the book exists but I’d like something that includes a mixture of classic and modern poetry with verses about love and tragedy, loss and longing, as well as poems written for children – I had a book of Roald Dahl poems was I was younger and loved it. Poetry would be ideal for a desert island because you can read verses over and again and find new meaning in the words based on your current mood or experiences. To be a writer you have to put in the hours and write, so the best advice I can give is not to talk yourself out of it. Don’t tell yourself it’s too late to start writing, or that the opportunity has passed you by. If you want to write, write and if that isn’t enough to get you filling that first page with words then ask yourself if you’ve found the right story. The story, when it comes, has to be one you’re desperate to get down on paper because you’re going to be spending a lot more hours than you think bringing it to life. And if a full length novel is too daunting, start off small to hone your skills. Writing competitions are a great way to develop discipline as they come with a theme and a deadline, and who knows, you might win the odd prize or two. That’s an easy one to answer. When I gave up the day job to write fulltime, one of the first things on my list of requirements was a dog. My cockapoo is called Mouse and she has a bed next to my desk. I start writing each morning at about eight o’clock and as lunchtime approaches, Mouse will move to the armchair where she will sit and stare at me to let me know it’s time to take a break. We go for our walk and that’s when I’ll have those little bursts of inspiration that keep the plot of my current book ticking along. My tenth book is going to be about a support group for young widows and widowers. I have three main characters who have all been widowed under the age of fifty and the story begins when the youngest and most recently bereaved joins the group. She forms close friendships with the other two characters and they each face challenges in their lives, one of which will lead to a tragedy. As the draft stands, the first scene hints at what fate awaits one of my characters, however, I won’t reveal what that is in case that opening doesn’t survive the editing process. 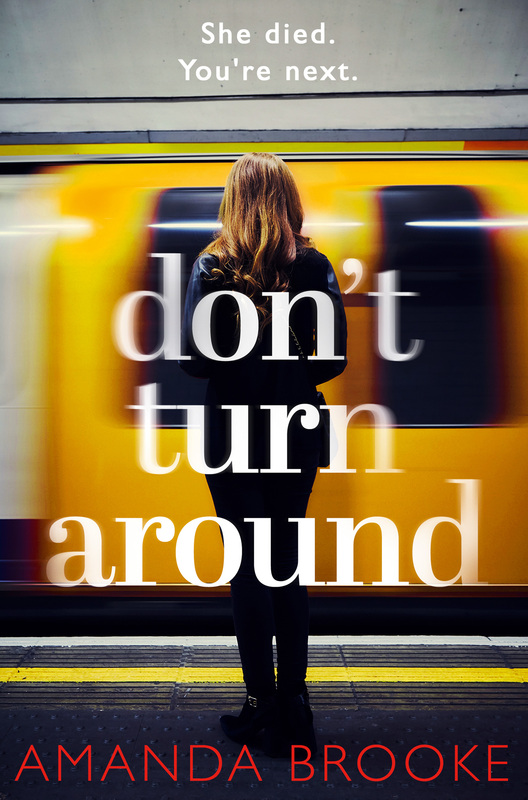 You can buy Don’t Turn Around from Amazon and is available to buy from good bookshops.